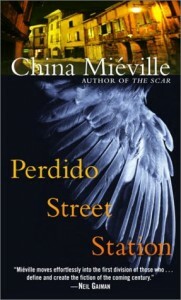 After reading Perdido Street Station, I can’t decide what China Miéville loves more: feverish world-building or the sheer impenetrability of his prose, and I say that as someone who (occasionally) enjoyed the book. It took me a good six months to make it through that dense little tome, mostly because I only managed to read it in 30-50 page chunks about once or twice a month, and I have to admit that in the end I only finished out of sheer bloody-mindedness. This was actually my second attempt at Perdido Street Station. I first bought it in 2003 and only made it about 50 pages in before putting it down for more than a decade. 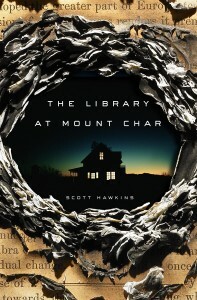 This time around, I gave it a bit more persistence, but it was never an easy book to pick up. Each of those 30-page sessions was hard-fought over the course of several hours, and I oftentimes found myself reading and re-reading passages just to make sure I’d fully comprehended their contents and meaning. I enjoyed many parts of the book, but I can’t help feeling a certain amount of exhaustion and relief after struggling to finish it for so long. In broad strokes, Perdido Street Station tells the story of Isaac Dan der Grimnebulin, inventor and disgraced academic, and what happens when a disfigured garuda – a sort of half-man, half-bird creature – named Yagharek comes to his laboratory in New Crobuzon and asks Isaac to help him fly again. Yagharek is flightless, his wings removed as part of a brutal judicial punishment, and he’s travelled hundreds if not thousands of miles just to ask Isaac for his help. Yagharek’s gold is plentiful and Isaac is in need of a patron, so he soon sets off on a quest to restore the garuda’s flight. What Isaac does not know – cannot know – is that he will inadvertently set into motion a series of events that bring only nightmare, catastrophe and death to his city and everyone he knows and loves. However, before the novel gets to the point where the plot kicks in, Miéville spends several hundred pages on setup, character development and a huge amount of world-building. If one of the characters visits a new neighborhood, Miéville includes a minimum of a few paragraphs describing how it looks, smells, sounds, pulses with life and interacts with the city around it. These passages are oftentimes beautiful, carefully drawn and incredibly dense, but over the course of the 600+ page novel, it becomes hard not to react with impatience when Miéville’s attention strays yet again to the architecture of his imagined city. The idea is, of course, that New Crobuzon is another character in the story, but the problem is that Miéville seems intent on including too much of everything; the kitchen sink, a few bathtubs and maybe a swimming pool for good measure. Every new neighborhood has enough detail to support an entire storyline, but Miéville barely takes a breath before introducing even more obscure and bizarre details. What seems magical and fascinating for maybe a hundred pages or so becomes overkill when it just keeps happening past the halfway point of the novel. Also, it doesn’t help that Miéville seems to delight in writing incredibly dense prose. I’m sure a large part of why I took so long to finish the book is that it felt like I was barely making any progress even though I would sit down and read for hours at a time. I was finally able to increase my pace a bit once the actual plot became clear, but at the same time I was a little disappointed to discover that all of Miéville’s baroque wordplay leads up to a relatively straightforward man versus monster story. Ultimately, Perdido Street Station was a difficult book that I respected and sometimes liked but can’t help finding fault with as I think more about it. I’m glad I finally finished it so that I can mark it off my near-infinite list of unread books, but it will be a good long while before I pick up another one of Miéville’s books. Of course, there are at least three others on my shelves, waiting for me to read them.